Florida basketball has a serious problem, and it’s getting worse by the day. The latest symptom of the problem was a 78-67 home loss to a Tennessee team that’s as logical a Final Four pick as any in mid-January. But as is the case against any team equipped and willing to take advantage of Florida’s profound lack of size, the Gators were abused down low when it mattered most in a game they led for most of the way and eventually lost. And this was in a game that Florida shot well for most of, but then fell back down to earth, missed their last four shots and turned it over twice in the final four minutes. Grant Williams led the way with 20 points for the Vols in his makeshift center role (he’s technically a forward), having his way with both Kevarrius Hayes and the zone throughout the night. He also led the Gator chomp as the clock hit zeroes, mocking the vocal Florida fans who had ridden him all game to further illustrate the issue of the O’Dome becoming a glorified practice facility for opponents. Since the beginning of last season, Florida has lost eight games on its home floor: FSU, Loyola Chicago, South Carolina, Georgia, Alabama, Michigan State, South Carolina again, and now Tennessee. For perspective, Kentucky has lost eight home games on its home floor in the last ten years, and Kansas has lost nine home games in the last nine years. But that’s all academic at this point, and all part of the symptom of the bigger problem. And by “the bigger problem”, I’m not even talking about White’s in-game coaching deficiencies. He’s lost several games with his schematics alone, including at home to Georgia last year by failing to defend against the three point line, which allowed Yante Maten to save the Bulldogs from a late seven point deficit and win in overtime, and including against South Carolina just last week by not aligning his team properly to defend against the one thing that could possibly beat them with :3.5 left in a tie game. A dominant inside man, like a Udonis Haslem, an Al Horford or even a Patric Young, can do a great deal to negate all of that. All the team has to do is feed the post and watch him go to work. To boot, that big guy can get you some valuable rebounds on missed shots on plays that were designed to go elsewhere and get you some free points on easy putbacks that way. Now, there’s obviously a place for three pointers and driving the lane on every basketball team to a varying extent, and with all the guard play in Mike White’s background, it’s natural to expect more of it on his team’s than on average. And traditionally, even before White, the Gators have been heavily reliant on the outside shot. The problem, though, is that without an inside game to complement it, you simply don’t have a complete enough team to win enough for the University of Florida’s standards. And that’s when you have a team that’s actually good at shooting threes. When you have a team that isn’t good in that department- through fifteen games, Florida currently sits at 171st in the nation with a 34.4% three point percentage- the need for a dominant big man is highlighted even brighter. And yet, Florida doesn’t have one. Mike White is constantly referred to as a brilliant basketball mind and a whiz in recruiting, but the fact that he’s recruited and signed one center* in the four recruiting classes he’s overseen contradicts both of those statements. Making matters worse, that one center (Gorjok Gak) is hurt, and is out for the foreseeable future. That leaves Kevarrius Hayes as the only scholarship center on the entire roster, and for whatever reason you want to blame this on, he simply hasn’t produced. And without anybody better- or anybody, period- to go to behind him, that’s a fatal problem. Which falls solely on White. He’s the head coach, and he’s had four cycles’ worth of chances to go and land some centers. Because he didn’t bother to do it more than once, because that one center is still hurt, and because this team is not good at scoring from the outside (or even at the free throw line), Florida is ultimately screwed for the duration of this season and possibly longer than that for the simple reason that they have no reliable method of putting the ball in the basket. Oh, they’ll have hot shooting nights, and opponents will have cold shooting nights, and you’ll get results like the second Butler game every so often, but this is not a sustainable formula for winning games. 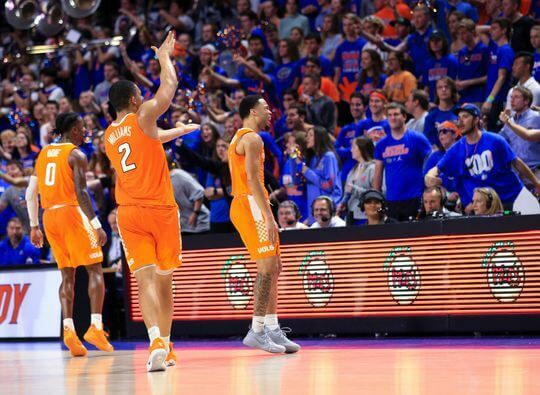 On the other side of the court, Grant Williams was not the first opponent to take advantage of the Gators’ lack of size in the paint this season, and he will not be the last. Only because Arkansas center Daniel Gafford got in foul trouble and had to sit for a large portion of the game is Florida not sitting at 0-3 in the SEC right now, and the Gators have plenty more opponents left on their schedule with big men who can abuse them down low. Moving forward, things look even bleaker. White does have four star center Omar Payne signed for next year’s class, and he’s promising, but he’s also very raw and is going to take some time to develop. Meanwhile, for all his faults, Hayes is at least an experienced big man this year, and he graduates this spring. So the Gators’ only interior options in the 2019-20 season will be the seldom used Gak, and a true freshman, and unless then-sophomores Noah Locke and Andrew Nembhard can start generating 25 points a game apiece, next season could be more of the same. And more of the same of this is just not acceptable for too much longer. On a personal level, I like White very much. I think he is a very solid basketball mind, all things considered. And I do think that he will be successful at some point down the road. But he’s making it abundantly clear that that point will not come with him in Gainesville. And so while of course I hope he will prove me wrong, the time may be nearing to have a much more difficult conversation about the future of this program.